After the release of the book Idiots in Politics in Arab language in Egypt this August and the novel The Jubilation Zone in Hungary this October, the latter is available for readers in Bulgaria as well. Bratislava/Sofia, December 3rd – The Slovak author Jozef Banáš has achieved another international success this year. After the release of the book Idiots in Politics in Arab language in Egypt this August and the novel The Jubilation Zone in Hungary this October, the latter is available for readers in Bulgaria as well. Banáš´s multiple award-winning novel The Jubilation Zone was published by the Bulgarian Publishing House PIC in Veliko Tarnovo. 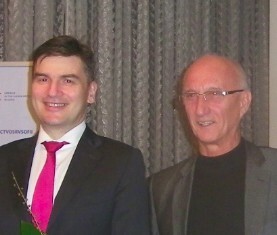 “The book was introduced by the literature scientist Asen Milchev in the presence of the Slovak ambassador in Bulgaria Marián Jakubócy at the Slovak embassy on December 1st”, Jozef Banáš confirmed. He mentioned that the following day the book was ceremonially released in the historic building of the University library in the cradle of Bulgarian culture Veliko Tarnovo. The event was open to the broad public and was attended by the author himself, by the Slovak ambassador in Bulgaria Marián Jakubócy, the dean of the Faculty of modern languages, the professor Tsenka Ivanova, as well as the translator Fabiola Vicenová. Students of Slovak studies at the St. Cyril and St. Methodius University did not miss the opportunity to meet the bestselling Slovak author neither. On this occasion Jozef Banáš offered an interview to the daily paper Trud. After the releases of its Czech, German, Polish, Ukrainian, Hungarian, Hindi and Bulgarian versions, the novel Jubilation Zone has become the most translated book in Slovakia – with the English translation on its way.